Members of Birdsong Committee are, from left, Janet Sargent, Garden Club of Darien president; Debbie Bussey; Emily D'Andrea; Susan Brewer; Carol Caufield; and Susan Balloch. 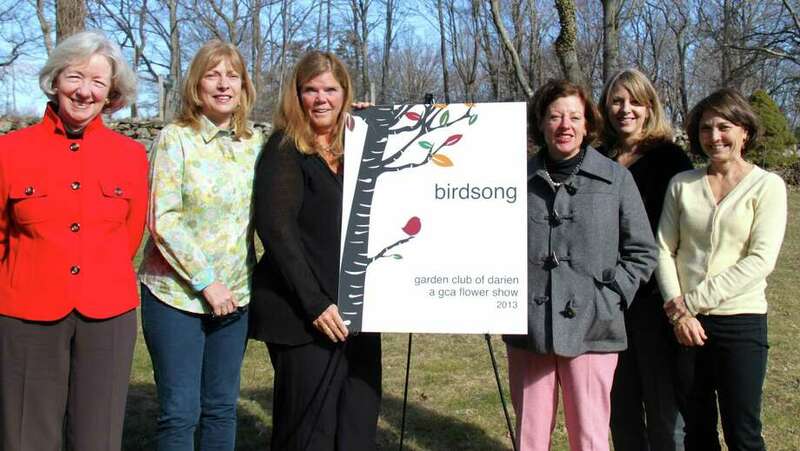 Plans are under way for Birdsong, a Garden Club of America-sanctioned flower show presented by the Garden Club of Darien at the Darien Community Association on Oct. 3 and 4. Proceeds from the show's preview party, silent auction and raffle will be used to help the community repair damage from recent storms and improve town beaches and parks. Among the events will be the Fairy House tour for children and families in the woodland bird sanctuary of the DCA, 274 Middlesex Road, and a conservation exhibit of the Weed Beach native planting project funded by the garden club from its last flower show, September Serenade, in 2008. The selection of the theme of the show was influenced by the recent restoration of the bird sanctuary at the DCA. There are four divisions -- Floral Design, Horticulture, Photography, and Botanical Arts (jewelry) -- with more than 30 classes, all of which will reflect the birdsong theme. The show is open to members from GCA clubs across the country. "The Garden Club of Darien is hard at work on production plans for the show and hopes the outcome will inspire the inner gardeners, conservationists, and designers in our community," said Janet Sargent, president of the GCD. "The Fairy House exhibit will delight children and adults alike -- all will be fascinated with the tiny abodes and their unique construction from natural elements in our back yards." Fairy Houses are small structures made of sticks, bark, dry grasses, pebbles, shells, feathers, seaweed, pine cones, nuts and other natural materials. They can be small and simple or larger and more ornate -- anything that is inspired by the creativity of children and other nature lovers. Garden Club of America flower shows have for decades been the premiere venue for members to showcase their talents in floral design, photography, gardening and other horticultural endeavors. The shows also bring to their communities current trends in conservation, highlight the philanthropic and beautification projects member clubs have undertaken in their communities and provide educational opportunities for all. Birdsong will feature an exhibit of the recently completed Weed Beach project at Darien's seaside park. The new native plantings at the park entrance were planned and donated by the GCD to the community to raise awareness of the environmental importance of native plants.